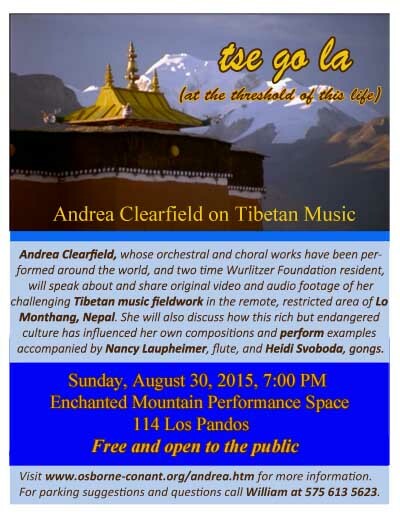 The composer Andrea Clearfield will present her Tibetan Recording Project at the Enchanted Mountain Performance Space in downtown Taos, New Mexico, next Sunday, Aug. 30. It’s free and open to the public. (See details of time and place.) “Clearfield’s orchestral and choral works have been performed around the world,” according to an advance program note. She will show original video and audio footage of her Tibetan music field work and discuss how it influenced both her life and her work. Clearfield will also perform examples of her compositions accompanied by Nancy Laupheimer on alto flute and Heidi Svoboda on gongs. This work is excerpted from her cantata on rites of passage, Tse Go La (At the threshold of this life), composed in 2012 and scored for double chorus, chamber orchestra an electronics. It was inspired by field work in the restricted, remote Himalayan region of Lo Monthang in Upper Mustang, Nepal, where Clearfield recorded and documented indigenous folk music with Katey Blumenthal, ethnomusicologist and anthropologist. This ancient horse culture is threatened — and efforts are being made to help preserve their music, dance, medicine, religion, language and art. Under the auspices of the Rubin Foundation, Clearfied and Blumenthal recorded 130 songs that had not been previously documented. The people of this region, just over the border of Tibet, are ethnically Tibetan. These songs are sung in the Mustang dialect of Tibetan. 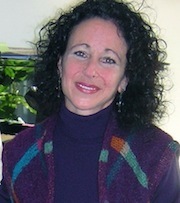 Shar Ki Ri (Mountain in the East) is a tro-glu, common folk song that often includes dance. Tse Go La was co-commissioned by the Mendelssohn Club of Philadelphia and Pennsylvania Girlchoir as way to bring these songs for the first time to the U.S. This recording features the Pennsylvania Girlchoir and the Chamber Orchestra of Philadelphia in Movement II of the cantata. The Enchanted Mountain Performance Space is the brainchild of William Osborne and Abbie Conant.